Double bird cages save space and can make your birds happier by allowing them to live close to each other while still having their own space. They’re also perfect for for preventing fights between your birds or if you’re interested in breeding. Double cages are available in many sizes and a number of different configurations. So let’s see if these multi-purpose cages are right for you and your birds. A double cage can take up less space than two separate cages. Double cages can be obtained that stack the cages either horizontally or vertically. One cage is easier to clean than two, though having more than one bird may increase the frequency of cleanings. 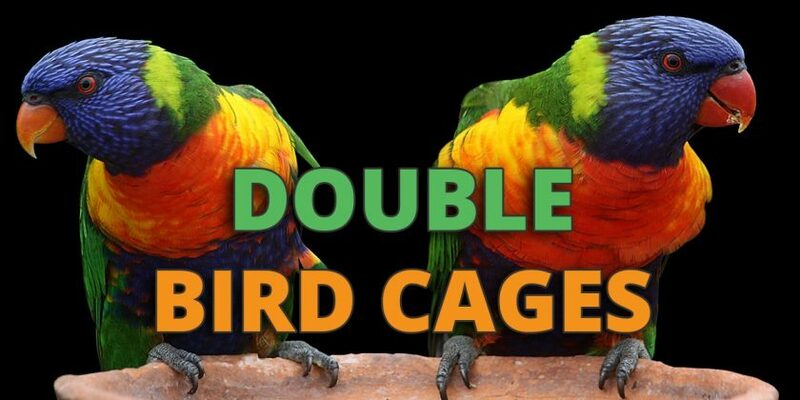 A double cage can create a nice environment for two species of birds that may not be suitable to live together. 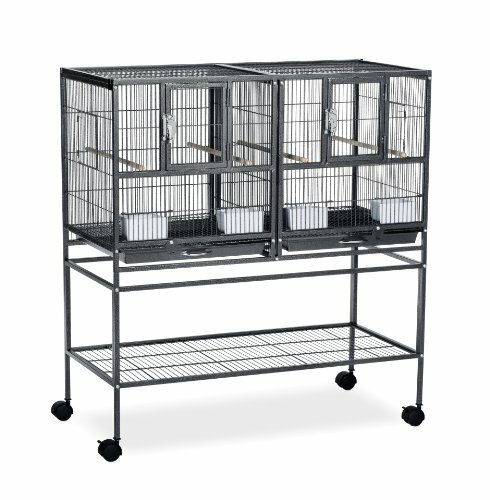 According to birdtricks.com, budgies and cockatiels should not be in the same large cage, but can be housed in one unit and kept separate from each other. Always exercise caution when mixing species. Most double cages are equipped with dividers that can be removed to create a single large cage. You can set up each side as if it were an individual cage where your bird will feel comfortable and have the option of removing the divider to let your birds interact when you deem it appropriate. Simply put the divider back in and you can easily separate them whenever you desire. Even if you keep the divider in at all times, the two birds can see each other and not feel alone if you are not always around to give them attention. If you are attempting to breed birds that have not met before, then using a double bird cage is necessary. This is so the birds can familiarize themselves with one another before being allowed to fully interact. It may also be preferential to get vertically stacked cages for certain types of birds. According to xtremparrotlets.com, your parrotlets may be more likely to breed if they can hear, but not see each other. Below is a video showing a double cage with the divider removed to provide a large home for some finches. All cages with a divider offer this type of option. Cage decoration – This can be a problem if you favor rope or other perches that extend the length or width of your cage. You cannot attach these to the divider wall if you plan on removing it, so you essentially will only have three usable sides. You really can’t hang any toys on the divider if you want to remove it frequently without incurring extra work. While this should not be a deal breaker, it can pose some aesthetic concerns with how your birds can perch and see the world around them. Also, you may require twice the amount of toys to keep both birds happy. Over-bonding – Your birds may really like living near each other and bond together so strongly that they no longer want to be bothered with their human caretakers. Obviously this is not a problem for people looking to breed birds. This is also less likely to occur if you interact with your birds daily. Cage size – Ensure that each half of the cage is of sufficient size to comfortably house the species of bird you plan on keeping. 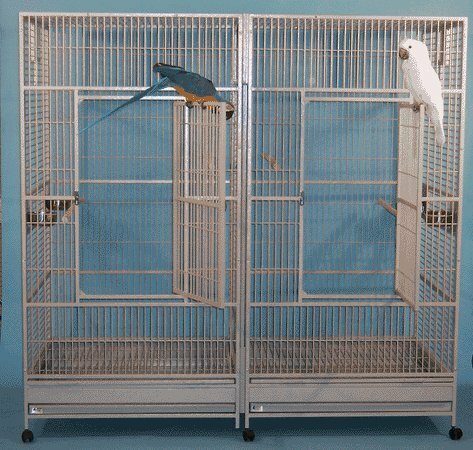 Bar size and bar spacing – Though a double cage meant for parakeets may be large enough to house a larger parrot if it is not divided, the bars may not be strong enough to prevent your bird from biting its way out or injuring itself. Ensure the cage is species appropriate. Cage stand – Some cages include a stand and some do not. Make sure that the cage you choose has one if you need or want the convenience of having the cage and stand integrated. Stands with wheels are easier to move around and should be considered. Gap when the divider is removed – This can be a critical point, as when the divider is taken out there will be a gap in the cage that may be larger than the rest of the bar spacing. This can allow your bird to get its head stuck or potentially escape the cage. Be sure to check on this issue, especially if you have smaller birds. Price – The cost of a double bird cage ranges from several hundred to several thousand dollars based on the size and durability of the cage. Roomy cage for the medium and small sized birds. Horizontal stacking so birds can see each other. The gap with the divider removed may pose a risk for very small birds. Bars may not be strong enough to hold larger or heavier perches. 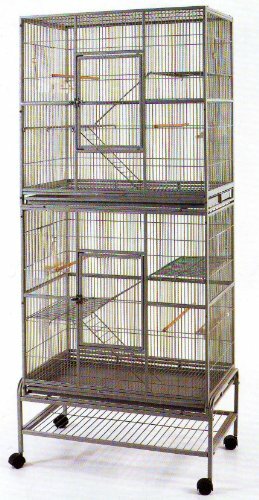 This double cage by the Mcage company is suitable for small to medium birds, up to the size of a conure or cockatiel. Its dimensions are 63”Lx19”Dx64”H inches (160x48x162 cm), with the height of the cages approximately half of the overall height. The bar spacing is 1/2 inch (1.27 cm). The cage is constructed of durable wrought iron and includes a stand with casters and a shelf for storing supplies. When your cage arrives it is easily assembled and can be broken down for storage if required. 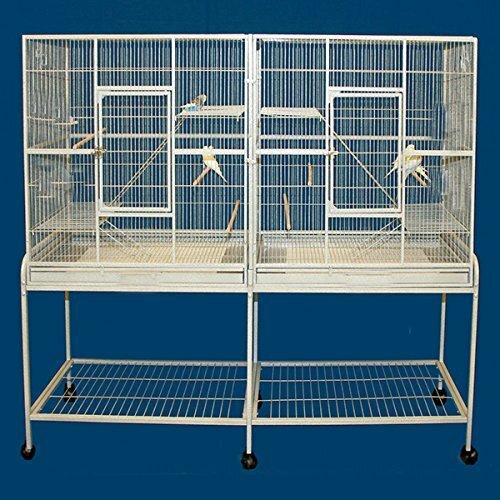 It can be used as two side by side cages with the divider in place, or one large spacious cage with it removed. The cage comes with 8 feeding/watering bowls and removable ladders and platforms for your birds’ entertainment. Each half of the cage has its own slide out tray for easy cleaning. This is a nice cage that offers options for those with small birds. Spring-loaded doors may injure stronger birds that can push them open. An additional cage lock is recommended to fix this. Nesting box may be too high for baby birds. Size only suitable for small birds. Prevue’s Hampton Deluxe is suitable for small birds such as parakeets or canaries. Its total size is 37 1/2″ X18″ Wx 40 1/2″ H ( 95.25×45.7×102.9 cm) on the stand. The cages themselves are 20 1/2” (52 cm) high and bar spacing is 1/2 inch (1.27 cm). These cages are designed so that multiple units can be stacked on top of each other. Each cage has a pull-out tray for cleaning and comes with 2 perches and feeding cups. The front door has a lock, but the nesting box door is spring-loaded. The unit is constructed of wrought iron and the stand is equipped with wheels for easy movement. Here is a video that demonstrates the cage in use. A good cage for small birds but take care to secure the nesting box doors. Great cage for large birds. Feeding bowls and front door lock securely. Strong construction to withstand chewing parrots. The unit is very heavy, with a shipping weight of around 400 pounds. Not good for small birds. This cage by BirdCages4Less is aptly named. It is a big, strong cage that can house some large birds as each cage measures 40”x20”x79” (101.6×50.8×201 cm) with the actual cage height being 67” (170 cm). Removing the divider gives you a cage 80” (203 cm) long. Bar spacing is one inch (2.54 cm), and its made of wrought iron with 5 mm gauge bars. Six casters let you move the cage around with ease, and a flared steel skirt helps minimize messes. 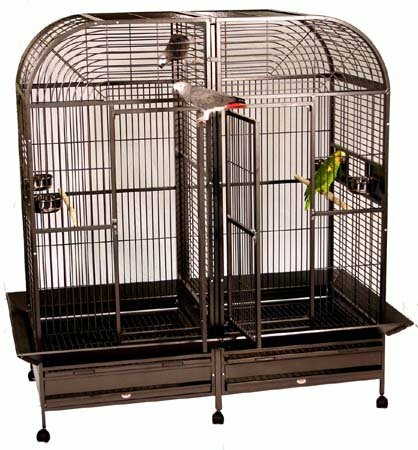 Accessories that come with the cage include 2 perches, locking food bowls and 4 food/watering cups for the 4 swing out feeder doors. The large, front access door has a sturdy lock. Two breeder doors and separate removable cleaning trays for each side round out this cage’s features. A great cage for two large birds or open it up to give a single bird a huge cage. Smaller footprint than horizontally stacked cages. Stand with wheels and shelf. Bar strength is not suitable for chewing parrots. No divider to expand cages. The two cages in this unit stack vertically. It is meant to be two separate cages where the birds cannot see each other. Measuring in at 30”x18”x74” (76.2×45.72×188 cm) including the stand, the individual cages are each 31 1/2” (80 cm) high with 1/2 inch (1.27 cm) bar spacing, making the dimensions appropriate for up to cockatiel sized birds. A heavy duty stand with a storage shelf and casters hold the cages. Inside each cage, three levels are created by the use of ladders and grating. This makes for some ideal exercise and play options for your smaller birds. Perches and food cups are also included and each cage has a slide out cleaning tray. This cage is a good choice for those who are planning on breeding small birds. Good cage if you want your medium-sized birds to hear but not see each other. Double divider option for bird safety. Steel skirt to reduce mess. Cannot use with small birds. BirdCages4Less builds the Piilani Plantation with big birds in mind. The dimensions of each cage are 32″x32″x70” (81.28×81.28×177.8 cm) with 1 inch (2.54 cm) bar spacing and it is tough enough to stand up to the largest parrots. It has a double divider option to help minimize toe biting and other potential avian confrontations. Removing the divider makes a monster cage that a large bird will love. It is constructed of wrought iron and features strong, 5.5 mm gauge bars. Comes with two natural wood perches, locking food bowls and 4 food or water cups with swing-out doors. A large front door with a lock makes it easy to access your birds. A great cage for those with two large parrots or one that they wish to pamper. As you can see, there is a double bird cage to suit just about any pet bird owner or breeder. I hope we have helped you see the circumstances where you can benefit from owning one and what to look for when you are getting ready to make your purchase. The correct cage can make a big difference in the lives of both human and avian family members.